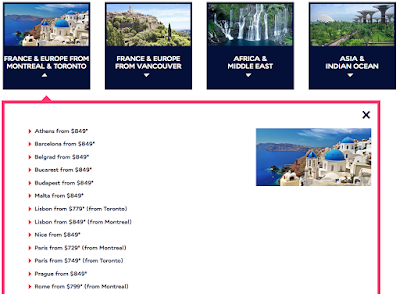 Rewards Canada: August 21 Update: Icelandair to launch Montreal service, Air France KLM seat sale, tons of great bonuses! August 21 Update: Icelandair to launch Montreal service, Air France KLM seat sale, tons of great bonuses! Final update for this week! Icelandair is adding service to Montreal starting in May 2016! This will be the airline's 5th Canadian destination with four flights per week out of YUL. Not only is Icelandair a great way to get to Iceland but in many cases they have the best fares to get to mainland Europe! Icelandair does have their own frequent flyer program called Saga Club but outside of travel (flights, hotels, car rental) the only way to earn Icelandair Saga Club points in Canada is via Diners Club Club Rewards MasterCard, Hilton HHonors or points.com transfers. (Source Airlineroute.net) Now they just need to launch Ottawa and Calgary service! Between August 24th – 30th, donate your Aeroplan Miles to Schools Without Borders (SWB) and Aeroplan will match all miles up to 500,000 to help you make double the difference! Full details.